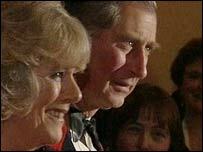 A call for an emergency Church of England debate to discuss the Prince of Wales's marriage to Camilla Parker Bowles, has been rejected. Some members of the General Synod urged that the marriage be discussed during the four-day February Sessions. A BBC Panorama investigation had questioned the legality of the couple's civil wedding to take place in April. But Reverend Dr Richard Turnbull, chairman of the business committee, said a debate would be "quite wrong". "I really believe we should have found time for this issue and to have a debate about this subject. "It has grave consequences for the future of the church, it has grave consequences for the future of this nation." He also referred to the Panorama's television documentary, screened on Sunday, which revealed there was some confusion over whether a civil ceremony would be permitted under current legislation. He said the BBC documentary had raised "a question over the civil wedding ceremony that is being prepared." He was backed by Philip Gore, from the Diocese of Manchester, who also said the matter should be debated. "I believe that the issue now is of religious and public interest," he said. However, Reverend Turnbull said the church's agenda was already "full and demanding". "Now is not the moment," he said. Reverend Turnbull said that although the public were very interested in the subject it was "of doubtful public interest". The General Synod meeting at Westminster will debate controversial issues such as arguments for and against the ordination of women bishops and a report on homosexuality. Delegates will debate proposed changes to the clergy which could end traditional jobs for life. In opening the General Synod, the Archbishop of Canterbury Dr Rowan Williams prayed for those "in the glare of publicity" and asked that Prince Charles and Camilla received "God's guidance and help". After the issue of the marriage debate was rejected by the Synod, the Reverend Prebendary David Houlding, from the London Diocese, urged all members present to pledge their support for the royal couple. The delegates then broke out into a round of applause in support of his words.